Kayaking is becoming an increasingly popular sport, but the size and cost of a traditional hard-shell can be prohibitive. The good news is that modern technology has made inflatable kayaks a reality. These alternatives are both cheaper and more portable than their more traditional siblings. The following are some of the best inflatable kayaks currently on the market. This pre-assembled, folding kayak is designed to look and feel like a rigid frame model and its quality construction makes it our top rated inflatable kayak. The built-in aluminum ribs create a proper bow structure to ensure superior tracking over other inflatables. With its 10.5 foot length, even individuals over 6 feet tall have no issue fitting comfortably (unless they have ridiculously long legs). A high support, adjustable padded seat means your voyages will be a comfortable one, while the durable triple-layered PVC tarpaulin hull provides minimal risk of puncture for whitewater lovers. It’s one of the few inflatable models many experienced users have deemed safe for ocean kayaking even though that’s not really what it’s intended for. It might seem like a lot, but there are seven air chambers within the hull. This is actually one of the kayak’s strongest points, as a puncture is less likely to capsize or flood the boat. Inflation with a bi-directional hand pump only takes about 15 minutes. Pair this with a deck bag, and you’ll see why this model is so popular. Search any kayak enthusiast forum and Advanced Elements is constantly recommended for a good inflatable kayak. While rated at 300 pounds, it should be noted that the max weight for an individual is only 235 pounds. The additional 65 pounds is intended for gear allowing the weight to be spread out more. Adding in a backbone can improve the amount of weight support beyond this limit, but going without will cause the portion under the seat to sag. Additionally, it can be easy to inflate the kayak wrong, causing it to become lopsided and track poorly. Arguably the best 2 person inflatable kayak out there, this impressive raft can hold up to 650 pounds of people and gear, with space enough to accommodate a third person. With size comes plenty of features, such as two bottom skegs, lashed down inflatable spray skirts, and a bow and stern grab line. The hull is made of sun and saltwater-resistant material that is durable enough to earn this kayak a Class III whitewater certification. At 12 feet in length, it’s one of the longest 2-person inflatables you’ll find. The Sea Eagle is a great option for excursions with your dog, as the PolyKrylar hull is able to hold up to their claws. As with any other kayak, make sure your pup is wearing their dog life vest and you yourself are wearing a good life jacket for kayaking. Owners love the amount of space this model provides, and when used for ocean or lake excursions, the ability to flex makes it handle better against waves while the self bailing valve is invaluable for rapids. In general users have felt very little risk of capsizing even in three feet swells. Being an inflatable craft, the SE370 isn’t immune to puncture, and a few consumers have noted seam rips after several seasons of use. It’s important to note that while the warranty generally only covers kayaks bought direct, Sea Eagle has honored the warranty when provided with a copy of the original receipt by the distributor. On a more minor note, keep in mind that this raft sits lower in the water than solid-walled craft and is thus not suitable for stormy weather. Arguably the best inflatable fishing kayak on the market, this two-person craft is designed to handle the best and worst lake fishing has to offer. At 10 feet, 9 inches long, the Coleman Colorado has a 470 pound weight capacity. While not as stable as an inflatable pontoon for fishing, a kayak can’t be beat for maneuverability and tracking. You’ll have to consider what’s more important to you. The hull is made of rugged 18-gauge PVC, a 1000D tarpaulin bottom, and 840D nylon cover with an airtight system designed to prevent leaks. In the event of a puncture, the kayak features multiple air chambers to prevent sinking (and, unlike the Titanic, these chambers are fully sealed). Consumers fishing on larger lakes can appreciate features such as rod holders, outboard motor compatibility, and ability to stow the paddles when not moving. The amount of storage space is also of note, making this the perfect fishing craft for beginners and veterans alike. There are two frustrating factors that a few owners have run into with this product. The chambers on more than a couple occasions have been known to deform over time, making the boat less efficient and increasing the chance of deflation while on the water. Also, customer service seems to be problematic for several who’ve run into issues with this craft, although others report a very positive experience. This complete set includes two paddles, two high-backed EVA padded seats, rear tracking fin, repair kit, travel bag, and a double action pump that can inflate the kayak in under 10 minutes. The Voyager is 10 feet in length and has a 400 pound weight capacity making it suitable for a large person or two smaller individuals plus gear. The rocker profile and pointed nose entry help ensure superior performance even in choppy waters, making this an excellent choice for a day on the water. Owners report being able to withstand 10 MPH headwinds and high chops with ease in this craft. The durability means owners rarely give a second thought to pulling the kayak up on a rocky beach, and inflation time is one of the fastest for this type of craft. The few complaints about this kayak all seem to stem from manufacturing defects. These seem to comprise mostly of bad seams in the bladders, making it important to remember that new products should always be tested upon arrival. This 12 foot long two-person kayak has plenty of extra space and is designed for both lakes and moderate whitewater conditions. The semi-rigid, heavy gauge PVC construction can support up to 500 pounds, yet is highly portable when deflated. Not only does this craft track well, it has plenty of storage options, such as D-rings, to help keep your gear secure. Known more for their popular line of towable tubes, Airhead understands durability and ergonomics. You don’t have to worry about ripping this kayak in Class III rapids, as it can hold up to rock impacts quite well. It tracks better than many similar models, making it a good choice for smooth waters when you don’t feel like tackling whitewater. Considering this thing even includes neoprene arm rests, it’s perfect for a quiet day on the water. While not necessarily a bad thing, customers have found the bladders to be a bit irritating, as sand and debris often gets stuck between the bladder and hull. Additionally, there have been a few problems with stitching that slipped past quality control. Designed for a quiet day on the lake or river, this roomy two-person craft has adjustable inflatable seats with a curved backrest designed for improved comfort. A removable skeg improves directional stability, while the bright yellow adds high visibility in case of an accident. The 30 gauge heavy duty vinyl hull has good puncture resistance and includes three bladders to further reduce the risk of sinking. Rated for up to 400 pounds, the Explorer K2 is a little over 10 feet in length so it’s perfect for one larger individual or a parent taking their child out on the water. This kayak was obviously designed with a quiet Sunday afternoon in mind. Without the seats, you can sit facing your loved one as you relax on calm waters, and the boat is shaped well enough to keep it stable in the event you plan to do some snorkeling. Individuals with lower back issues will have some problems staying comfortable in the seats, due to the low height. Also, be warned that the included patch kit doesn’t provide silicon glue, so you will need to purchase a tube separately. Lightweight and sleek, the K1 is the little sister to the K2 and has all of the benefits, plus some additional features making it a popular cheap inflatable kayak. 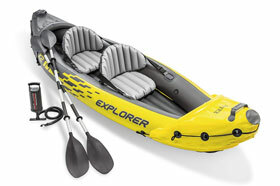 It includes an 84-inch aluminum oar and hand pump, making it perfect for beginners to get introduced to kayaking. The heavy duty vinyl hull includes a spacious cargo net for maximum storage. The wider design also makes it more resistant to capsizing than other inflatables of similar 9 foot length. While it may have a relatively low 220 pound weight limit, owners have reported this is a great kayak for dogs who like to tag along. The added durability makes this a great choice for most excursions on smaller bodies of water. Best of all, it packs into a small space, allowing you to take it on long cross-country hikes. A small number of consumers have reported several issues with the skeg coming off and being difficult to get a replacement for. The instructions are outdated, which may have something to do with people receiving the wrong skeg after calling in their warranty. A few users have also reported punctures appearing while in storage, despite not being around sharp objects. While extremely popular, the concept of an inflatable kayak might be quite foreign to many sport enthusiasts. The following are a few common questions that come up when thinking about getting an inflatable for the first time. Back in the early days, inflatable kayaks were fragile things prone to puncture and tears. It wasn’t long before multi-layer hulls were released, as well as a number of other safety features. Nowadays, inflatable kayaks are just as safe and durable as their hardshell counterparts – sometimes even moreso, thanks to their flexibility in choppy waters and wider base. Many are even safe for dogs due to the puncture-resistant materials used. Inflatable kayak vs hardshell – Which is better? The answer to this question has evolved alongside the technology. At this time, many inflatables are actually more durable than a hardshell, being able to flex and reshape around rock or wave. They’re cheaper, highly portable, and weigh a lot less. Hardshells still have their own advantages in certain waters or tasks, but have a hard time competing with an inflatable for cost and convenience. What’s the best way to get in and out of an inflatable kayak? Due to their design, it’s a little more difficult to get in or out of a kayak in general. Inflatables have the advantage of grab lines, but boarding one of these little guys on your own can still be a hassle. The easiest method is at the low end of a dock, sitting down and sliding from the dock into the seat quickly, turning to face front before the craft has a chance to escape. Rocky shores are more difficult, and using the paddle as a hold bar can prove highly beneficial. Place the shaft horizontally so one end is behind the seat and the other is on the shore. Applying a little pressure to the bar, squat down and gently slide into the craft. Note that getting in or out of a kayak is much easier if the water’s calm.